My friends, Rachael, Laura, and Andrea, and I have decided to portray four sisters from 1907 for the Ball. I'm the eldest, and a bit prim; Rachael is the free spirited Bohemian; Laura is a tomboy; Andrea is a persistent little flirt. Of course, our costumes must reflect our personalities! I've been commissioned to work on the girls' gowns over Christmas break, and I'm wondering "What have I got myself into?!" I don't even own a sewing machine. 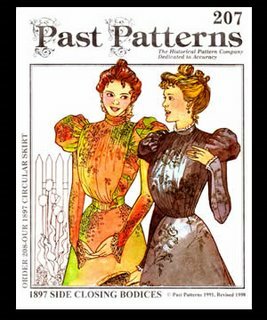 For my costume, I'd like to do a waist along the lines of this pattern from Past Patterns. It's ten years out of style for 1907, but I'm an old maid, so it will work. Butterick has pattern along similar lines. See Butterick 3417. Depending on how good a deal I can get on fabric, I may even make a skirt to match from Butterick 3418. Otherwise, I shall have to wear my Folkwear Walking Skirt. For the other girls' costumes, I think I will use the same skirt pattern with variations. Rachael's waist should have a V neckline with an high-collared inset; Laura wants a square neckline, and Andrea wants something off the shoulder. I'm hoping to find some vintage evening gowns to tweak. I haven't found existing patterns for the girls' and I don't have time to draft draft patterns for each girl's dress. I knew it. The Laura Ashley company would, eventually come to its senses, and reproduce some of the winsome styles that were once so popular. I've been a Laura Ashley imitator all my life, and since I've decided not to pursue fashion design as my vocation, it is a happy thing indeed to see other companies producing pretty things for ladies. It's about time. College of the Ozarks is celebrating 100 years of Hard Work. In February, there will be a gala Heritage Costume Ball. Donning Edwardian costume for an evening of fine dining, music, and historic dance sounds delightful! I'm having some trouble locating examples of evening attire from the period, either pictures of extant garments or fashion plates. As I glean inspiration on the web, I will post it here, a blog just for fashion and costuming!